This year marks the 350th anniversary of the final version of Thomas Cranmer’s Book of Common Prayer. Thomas Cranmer, the archbishop of Canterbury under Henry VIII, published the first Book of Common Prayer in 1549, over 100 years before the Psalter was added in 1662 to complete the version we now have. The fact that the Book of Common Prayer remains relevant today is a testament to its power, depth, lucidity, and universality. Cranmer wrote the Book of Common Prayer in hopes to make the worship material of the Latin liturgy available to the English laity. The impact this had on the English-speaking world was far-reaching. And Daniel Swift, author of “Shakespeare’s Common Prayer’s,” describes the Book of Common Prayer as the “skeleton beneath the skin” of all of Shakespeare’s works. The skeleton or the core of the Book of Common Prayer that Swift speaks of is no doubt the community of people who recite its words and prayers. These communities orient their lives around the prayers for baptism, communion, marriage, and funerals, and it is because of this communal nature that the book is known to religious and nonreligious worlds alike. James Wood, a nonbeliever, recently wrote a piece for the New Yorker on why the Book of Common Prayer remains of such religious, political, and cultural importance. 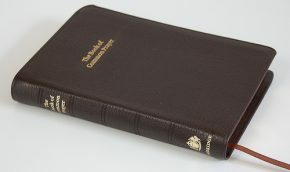 Wood says that the most important reason for the endurance of the Book of Common Prayer is Thomas Cranmer’s use of language. However, Wood’s closing words to the piece are a sobering reminder that although our society still possesses the language of the Book of Common Prayer, we have collectively lost the religious belief that was central the book’s meaning and binding capabilities. The Book of Common does not remain “empty” in all communities, to be sure, but the fact that it remains that way in many communities is reason enough to re-open its pages and learn how Cranmer and the early Protestant believers understood how communities truly bind together.